The dispute is framed by the attempt to control a small uninhabited archipelago located between Okinawa and Taiwan in the East China Sea. For the Japanese the archipelago is called Senkaku (Tokyo has administered it since 1972 when it was abandoned by the Americans), and Diaoyu in China, whose claim to ownership is based on strategic need for the defence of its territorial waters. In a unilateral declaration, China has just created a new "status quo" from the point of view of international law, encompassing the islands within its maritime area of relevance. In reality, the "zone of identification for “air” defence” (Adiz) that China claims extends across the South China Sea, including not only the disputed Diaoyu Islands, but also encroaches on Korean territorial waters (which includes the island of Jeju) and that of Taiwan. Moreover, after Beijing’s statement the Chinese navy's flagship, the aircraft carrier Liaoning, arrogantly moved into the South China Sea, and its presence in the area is likely to be prolonged indefinitely. The aircraft carrier is escorted by two cruisers equipped with anti-missile missiles, the Shenyang and the Shijiazhuang. Japan has immediately responded by organizing air flights over the newly formed "no fly zone" to reaffirm the notion that the archipelago is Japanese and should remain so. To make matters worse the U.S. has put its oar in too. Obama has intervened decisively in the dispute standing shoulder to shoulder with its Asian ally and organising, in his turn, a series of "raids" on the archipelago in question. This is a warning to China about this issue specifically, as well as more generally throughout the area. If it does not take a lower profile it could lead to worrying scenarios for all the parties involved. In other words, the archipelago has opened an imperialist power play in which the actors, all of them powerful, have not hesitated to flex their muscles by shaking their fists under the noses of their opponents. Leaving aside the U.S., whose role, strategic interests and future prospects in the area are to support Japan and with the same intensity to oppose Chinese intentions, the battle between Tokyo and Peking has stepped up in recent months. For example, in August, Beijing organised a series of naval manoeuvres to coincide with the anniversary of the military defeat of Japan at the end of the Second World War. A month before China had already organised, for the first time since the end of the war, a convoy of merchant vessels through the straits that separate Russia from Japan. In response, the new president of Japan, Abe, on an official visit to Japanese troops, stated that he would not stand by watching the ambitions of Chinese imperialism with folded arms. It goes without saying that a lot of this tension over four rocks in the middle of the China Sea appears to be excessive for even the most inexperienced observers. In reality there is much more at stake. First, the most important trade routes for both Japan and China cross this stretch of sea. Tokyo sees the shipping lanes of its merchant fleet to Taiwan and South Korea especially threatened, and the area, has a gas field which is increasingly seen as being of considerable interest, given the almost total dependence of Japan on gas and oil for its energy. 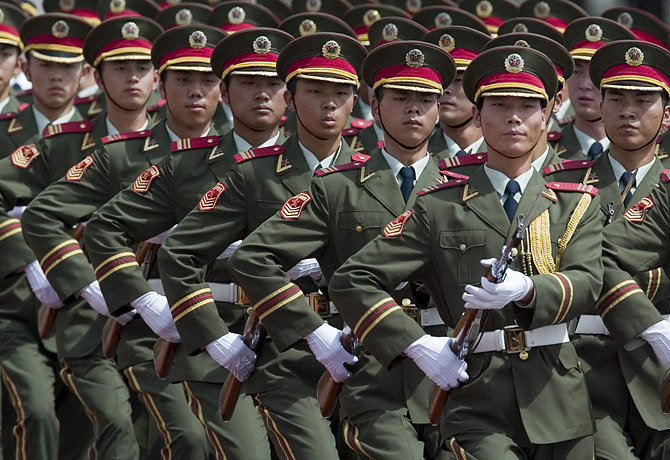 The second problem to be considered by Beijing is the need to break the military encirclement with which the United States has surrounded it. Washington's allies – Japan, South Korea and Taiwan – hold the East China Sea in such a military grip that it gives the Chinese leadership nightmares. Moreover, recently, the government in Seoul has concluded the purchase of F16 aircraft and other military equipment from the U.S., of the kind that had previously been made by Taiwan and always have been by the Japanese government.